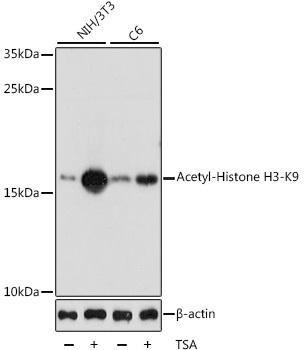 Western Blot analysis of Histone H4K16ac (Acetyl H4K16) Polyclonal Antibody with NIH-3T3 cell lysates. Earn up to 297 reward points for this purchase! 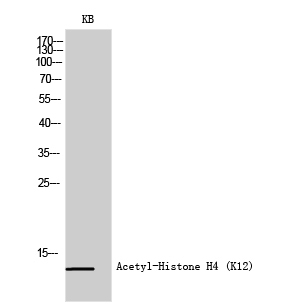 Detects histone H4 only when acetylated at K16 in mouse, rat, and human. Onyango DO et. al. (November 2017). PRPF8 is important for BRCA1-mediated homologous recombination. Oncotarget. 8(55):93319-93337. Lin J et. al. (June 2016). The relationship between apoptosis, chromatin configuration, histone modification and competence of oocytes: A study using the mouse ovary-holding stress model. Sci Rep. 6:28347. Onyango DO et. al. (April 2016). Tetratricopeptide repeat factor XAB2 mediates the end resection step of homologous recombination. Nucleic Acids Res. Gonneaud A et. al. (September 2015). Loss of histone deacetylase Hdac1 disrupts metabolic processes in intestinal epithelial cells. FEBS Lett. 589(19 Pt B):2776-83. Ding L et. al. (September 2012). Changes in histone acetylation during oocyte meiotic maturation in the diabetic mouse. Theriogenology. 78(4):784-92.